What makes Pink Diamonds - PINK?? What makes pink diamonds pink? They're one of the world's rarest jewels - but nobody knows for certain why pink diamonds are pink. That hasn't stopped investors from snapping them up at auction and sending prices skyrocketing. In October a new world record was set at a Sotheby's sale in Hong Kong when an 8.41-carat pink diamond sold for $17,768,041 (£11,438,714) - more than $2.1m (£1.8m) a carat. "Everybody's talking about them, and everybody loves them," says Jeffrey Post, curator of the National Gem and Mineral Collection at the Smithsonian's National Museum of Natural History in Washington, DC. "Yet you can't tell people why they're pink." 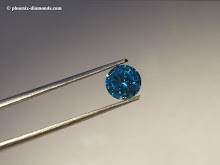 Other diamonds get their colour from chemical impurities that absorb light. 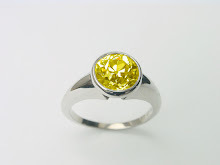 Yellow diamonds contain traces of nitrogen, and blue diamonds contain boron. But no similar impurities have been found in pink diamonds, leading scientists to speculate that the colour may be the result of some kind of seismic shock that altered the stone's molecular structure. It's now hoped that a cache of brown and pink diamonds from the Argyle mine in Western Australia may solve the mystery. The mine, owned by Rio Tinto, is the world's largest source of pink diamonds, even though they're so rare that only a few are produced each year. As well as revealing what makes them pink, scientists hope that studying the diamonds will tell them more about the history of the planet. Diamonds are the Earth's messengers, says Post. "They come from a hundred miles below the surface and tell us about a part of the Earth that we can't visit. They're also giving us a peek back in time because most diamonds formed about two to three billion years ago. "Each one is a time capsule, and the pink diamonds, because they're different from all the other diamonds, have a different part of the story to tell." 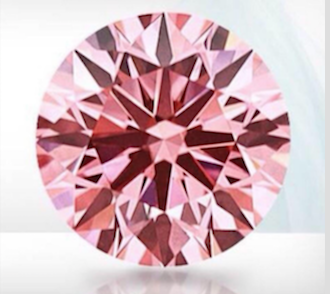 Scientists have already examined the Argyle diamonds using a mass spectrometer to try to find any trace of impurities that may be causing the pink colour. The machine agitates the diamonds and analyses the chemical structure of the atoms that are released. "There is no impurity that we've been able to associate so far with the pink colour in diamonds," says Post. "Spectroscopic measurements don't show you any additional features that you can ascribe to a particular colouring agent." They've also used a focused ion beam to cut a tiny trench in the surface of the diamonds and remove a slither than can be measured under a powerful electron microscope. They've discovered that most pink diamonds are not uniformly pink but have pink zones that alternate with clear areas. The zones, known as twin planes, were formed by some kind of shock - possibly the result of volcanic activity that propelled the diamonds to the surface or from something that happened to them as they were being formed deep underground. "The twin plane itself should not give rise to colour," says Post. "But we think when those twin planes form, and slide back and forth, one against the other like a fault plane, that certain kinds of defects formed. The defects give us the pink colour. But what we've not been able to do yet is find the specific kind of defect." Although pink diamonds are among the most valuable jewels today, 20 years ago they were little more than a geological curiosity. Sales have been driven by savvy marketing and a growing appreciation of their uniqueness. "It really comes down to the rarity," says Richard Revez, a gem expert at Florida-based Kravit Estate Department. "When you talk about coloured diamonds, they're already in the elite 1% produced in the world. Pink diamonds are the 1% of the 1%." He says the most sought-after diamonds are actually red, but orange, green, blue and yellow are highly desirable. An orange diamond attracted the highest price paid per carat for any diamond at auction last year, selling for $35m, or $2.4m a carat. "We've craved diamonds for millennia," says Revez. The first gems were probably discovered on river banks in India, but their existence is recorded in Greek and Roman history. "It was believed there was a vein that ran directly from the heart to the ring finger - that's why we wear (diamonds) on our ring fingers. And Cupid's arrows were tipped with diamonds to pierce the heart easier," he says. Archduke Maximilian of Austria is believed to have started the tradition of diamond engagement rings among the upper classes when he presented one to Mary of Burgundy in 1477. But it wasn't until the 1950s that international standards to grade diamonds were set by the Gemological Institute of America (GIA), a classification system that is still used today. But only science can reveal why pink diamonds are pink. Pink diamonds can be artificially created, says the Smithsonian's Post. And the only way to tell if it's a synthetic stone is to understand what causes the colour to occur naturally. "Then I can tell you for sure that that is a diamond that came out of the earth as opposed to one that came out of somebody's laboratory. It can make the difference of millions of dollars in the value of a single diamond, knowing whether it is a natural pink or not." Just what does a man who actually manufactures 'Memorial Diamonds' do with his own `Mum's ashes? What does a man - who makes memorial diamonds - do with his own Mum's ashes? The answer is - scatter them in paradise. My own Mum died suddenly whilst I was taking my Yachting exams, I wasn't told she had died until AFTER the exam, so it was a very sad time of both elation to pass the exams but to lose your Mum so unexpectedly. After the family funeral and as planned - I sailed away to live in the Caribbean for 5 years. The ashes had been under the stairs at my GF's house, but I had asked for them to be brought out to the boat. Coincidentally, my GF's Mum also died - just a few days before she was due to visit me in the Bahamas. So, in the end, both have been scattered in Paradise, a gorgeous place called 'Bakers Bay' - just outside Green Turtle Cay in Abaco. Sadly, at that time, I had no plans to start a new business in the funeral industry so I missed a great opportunity to save 100 grams of ashes with which I could have made my own 'Memorial Diamond' - from my Mums last remnants. I'm expecting my most serious 'competitor' (Russian) to be reading this, but for YOU (my reader and potential customer) I'll offer my opinion. 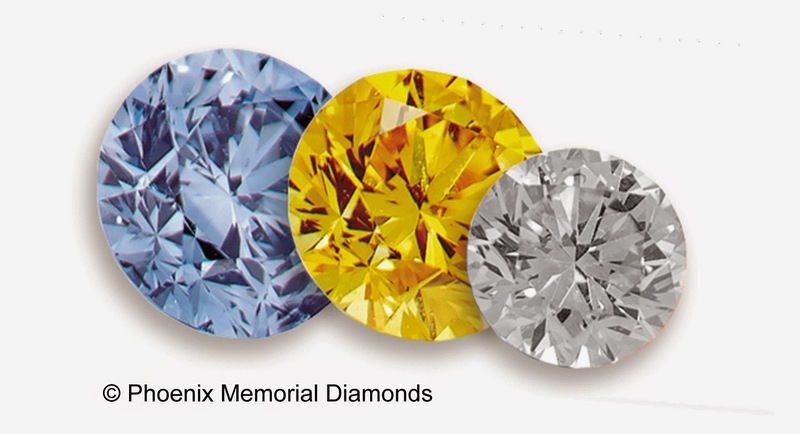 Personally - and it is my decision, Phoenix would not offer any diamond less than 1/4 carat - it is small enough and it very uneconomical to make just one, so we offer them in 'three's (the equivalent to a 3/4 carat order). Two of the 'others' will offer 1/10th of a carat - ridiculous, too small, the wind could blow it away and I could buy a 'mined' 10 point white diamond for you for just £22. Now disregarding their perplexing 'range' where they offer "0.1- 0.19" - so what are you paying for 1/10th or nearly 1/5th?? One website tantalisingly offers "prices start at £185" but beware, it's seemingly for one of four??? Another offers the size "Melee" just to confuse us all. It's still in the range 0.1 to 0.19 - bizarre! 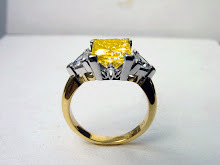 The other offers 0.1- 0.19 at £2295 - a whopping @22,950 per carat. We only grow NATURAL colours which stem from the special personal carbon you provide - Canary yellow (very like LifeGems) but not "Orange-Yellow" or "Yellow-Green". We also make what we term a "Free-Range" BLUE [what goes in - dictates what comes out] usually very light powder blue but sometimes Royal Blue and rarely sapphire blue. 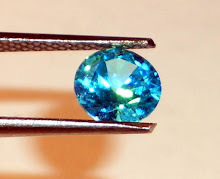 FR-Blue's costs £5475 for 1/2 carat. Another bizarre situation..... Being based in the UK, we charge Sterling. I have to question why the American LifeGems UK prices are massively over-priced in Sterling for the UK customers? The US Dollar prices are almost 50% cheaper. If we sell to America - the American's have to pay in Sterling - exactly the price you would pay in Britain. Despite what you may find in 'Google' there are many 'other' websites offering 'Memorial Diamonds' but all our older sites [ashes2gems & pets2gems, celebration-diamonds, and Live-on-Diamonds etc:] ALL offer the same telephone number and the exact same address - Sunrise House, Hulley Road, Macclesfield, SK10 2LP. The Sunrise House building was developed by this writer with Richard May and Julie Arnold in 1985 The huge 26,000 sq.ft' of offices with 75 car parking spaces are far to big for us, so we let out a range of supported serviced offices and their upkeep but it has been our base since we started. Our 'Memorial Diamonds' are actually real diamonds but made from the carbon within cremation ashes (Cremains) and also hair (if the deceased loved-one is being buried). Natural diamonds (mined) have grown deep in the earth, compressed by huge pressures and heated to fantastic temperatures - over millions of years. They are 'cherry picked' for COLOUR, clarity and quality - the most expensive are the 'fancy' coloured diamonds which sell for many millions. We grow our diamonds like they grow in the earth - under immense pressure, heated to fantastic heat, but instead of years your process takes a few months. 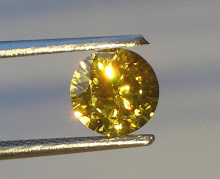 They are still REAL diamonds with ALL the exact same characturistics as natural mined diamonds, but the colours we make are within the very valuable 'fancy' range - not £Millions but certainly a few thousand. Canary Yellow is the normal outcome from the interference of nitrogen. They are very consistent in a light shade of yellow (a colour very sought after in the 'States). We cut our diamonds like 95% of the worlds diamonds are - with 58 facets in a round 'Brilliant' cut. 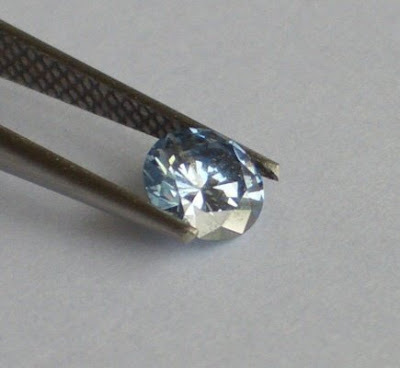 It is as complex to make 1/10th of a carat as it is to make 2 carat, we therefore have a minimum order as a compromise on costs and profit for value to you. 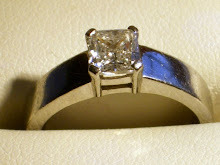 We also have a cut tolerance of 5 points (100 in 1.00 carat). 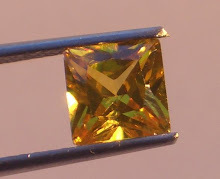 We never recommend any diamond less than 0.25, they are simply too small. Some of our famous 'firsts' include "The Jessica Diamond" (made from an umbilical cord of an 'at risk' baby). 'The London Riots Diamond" (from the detritus in the streets after the riots). "The Honey Bee Diamonds" (made from thousands of bees which died after colony collapse disorder. The profits when sold will be donated to a worthy cause to research of why bees are dying). 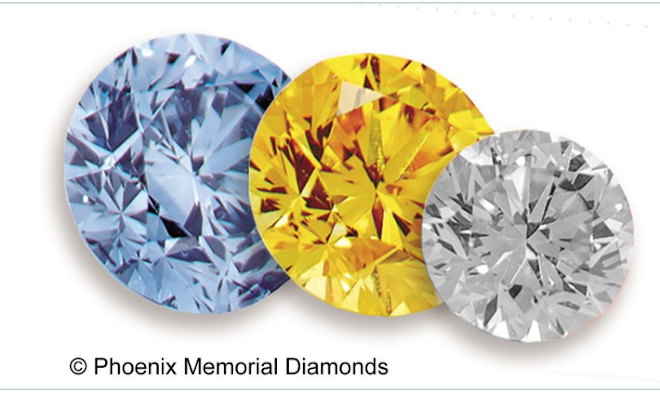 The 'Memorial Diamonds' we grow in our lab' are natural colours (not white as you would expect) but Canary Yellow and a free-range of Blue/White. We have been experimenting trying to produce PINK DIAMONDS and although this is currently very difficult using cremation ashes or hair, nevertheless some diamonds have been successfully grown which are a beautiful shade of pinks. They are REAL but NOT made from anyones ashes or hair (just pure carbon). If anyone in the UK is to become engaged/married and they would like to consider our REAL pink diamonds, they are all around the 1/2 carat weight, 'brilliant' cut (round) and we would be pleased to sell them for around £2500 each. Considering MINED Pink Diamonds are so rare and they are valued at $100,000 [£75k] - $250,000 [£175k] per carat - our lab' grown diamonds are a bargain.